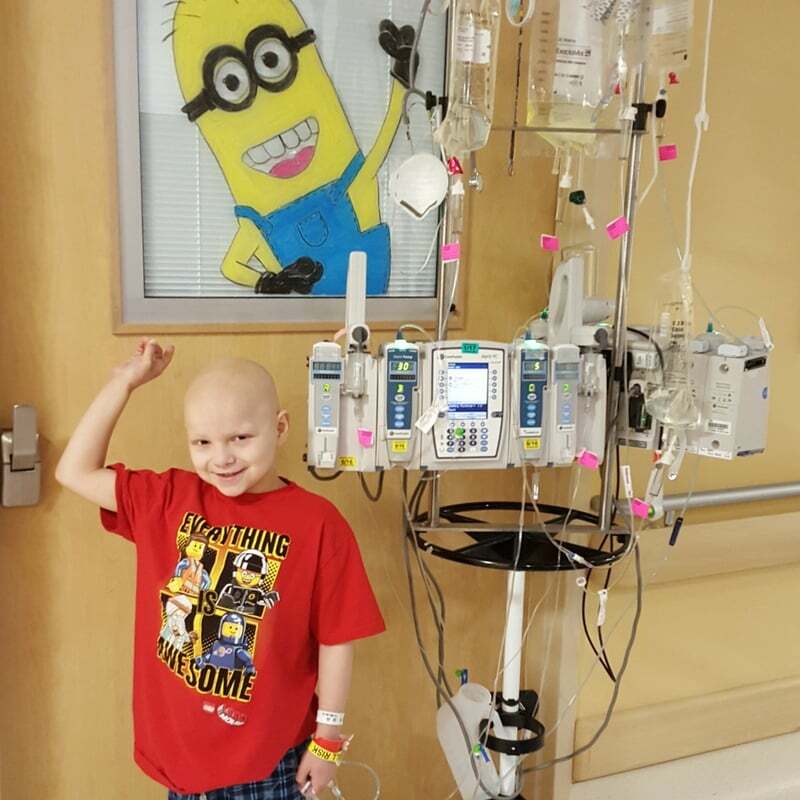 An articulate and gregarious boy, Landon was diagnosed with acute lymphoblastic leukemia (ALL) in January 2015 at just eight years old. He immediately began treatment in El Paso, Texas, one hour away from his home in New Mexico, with his parents, Heather and Richard, by his side. Within the first month, the family’s household income dropped by almost 50 percent, due to the leave of absence Richard took to help care for his son. With the additional medical expenses and travel costs, the Chavez’s were struggling to stay afloat. This was only the beginning of what is still an ongoing cancer journey. When Landon was referred to Children’s Medical Center in Dallas for a bone marrow transplant nearly a year later, Heather moved with him to Dallas and Richard stayed home to look after Landon’s older sisters, Mackenzie, 13, and Emily, nine. For such a close, devoted family, the decision to live apart was not an easy one. Heather was able to work remotely, but the additional strain of a second household took its toll on the family. As they poured their energy into helping their son beat cancer, Richard and Heather couldn’t make ends meet. Like the Chavez’s, another family has also experienced firsthand the financial burden of cancer. When Joe (Name altered), a hard working, single father was diagnosed with Stage IV prostate cancer, he was determined to control his disease long enough to ensure his children – two in college and one in high school – were settled into their adult lives. After only eight weeks of treatment, he had exhausted all of his paid time off and drained his savings due to the quickly mounting copays and out-of-pocket expenses. Fearing he would leave his children in debt, Joe asked his medical team to stop treatment and thus put an end to the additional costs that were eating away at his family’s finances, even if it meant surrendering to cancer. The average household income in the United States is around $52,000 while the average annual out-of-pocket cost for a cancer diagnosis is $35,000, according to the MD Anderson Cancer Center. With these figures, it’s not hard to understand why the Hutchinson Institute for Cancer Outcomes Research (HICOR) reports that cancer patients are 2.65x more likely to go bankrupt than people without cancer. Every day, they are making dangerous decisions – to skip a scan, to miss a chemotherapy appointment – just to stay afloat and keep a roof over their family’s head. The results are devastating. In fact, cancer patients who file bankruptcy have a 79 percent greater risk of early mortality says HICOR. For the many who read this, these are eye-opening statistics. But to the thousands of families, these figures are their reality. Both families are merely two of the thousands we have helped get back on their feet in the last 20 years. At Family Reach, we provide grants that help cover costs such as mortgage payments, transportation and groceries and are currently expanding our scope to offer financial coaching, navigation and education. This fall, we joined VP Joe Biden at his White House Cancer Moonshot Task Force release event where we addressed the financial toxicity of cancer and outlined its devastating effects on the entire family and on a patient’s chance of survival. While we’re proud of what we’ve accomplished, there’s more to be done. Through collaboration, innovation and partnership, we can address this overlooked issue from all angles and ensure families battling cancer maintain access to the medical care they need to improve their overall wellbeing and increase their chances of beating cancer. Carla Tardif is the CEO, Family Reach and was a finalist in the 2016 Costs of Care Story Contest. Thanks for these examples. And punishing cancer patients by throwing them into high risk but underfunded pools under the House health care act bill will exacerbate the situation.